Many people seem to doodle while they're in meetings. Doodling is a nice way to distract yourself with something, while ensuring that you can still follow what is being presented. I guess that's why those meeting centers hand out those incredibly thin notebooks. My doodles typically consist of writing down words that have to do with what is being presented. Now before you say "that is called: taking notes" - I take my notes in elaborate fonts. One of the fonts I came up with this time is a 'block font'. And since the meeting was rather long, I decided to create all letters. I should apologize to the speakers, because I wasn't paying too much attention near the end of their presentation. 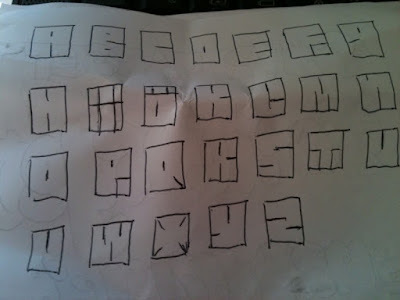 Coming up with all letters in a single style is hard work. I'm quite happy with most of the letters, but there's some that I really can't get to look decent. The I and the J are especially painful. Is there somebody with real designer skills that can show me how to do those character properly in this style?